As part of Catch the Bus Week 2016, one hundred school children from a school in Rhondda, Wales, ran a poster competition following suggestion by Bus Users Cymru. 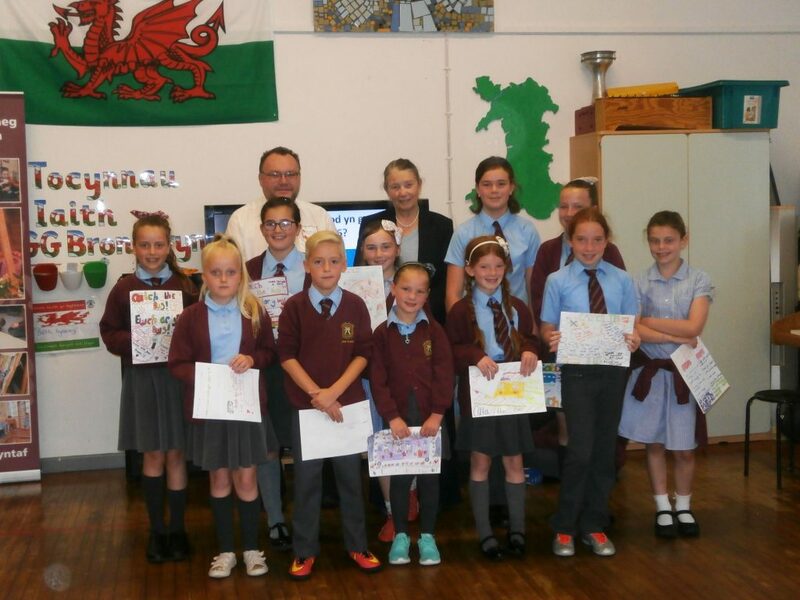 Children between year groups 5 and 9 from Ysgol Gynradd Gymraeg Bronllwyn school entered the poster competition, highlighting the benefits of bus travel and encouraging more people to choose to take the bus as an alternative means of travel. Margaret Everson and Barclay Davies, Director and Deputy Director at Bus Users Cymru, came to the school to judge the poster competition. The thoughtfulness of the entries demonstrated the research the school children had put towards the posters – from destinations and bus times, to fares versus diesel prices and how many people could travel on a group ticket. It was a very tough job for the judges to whittle down the excellent entries but the final decision was one first prize, second and third prize along with eight runners-up. All the winners and runners-up received prizes of book tokens.